Video games provide a chance to witness artificial intelligence (AI) craft characters and the dynamic systems that create the worlds within which we play. Much like when a good movie suspends the viewer’s disbelief, effective usage of AI in video games becomes imperceptible as the players immerse in the experience. Bots turn into characters, and systems turn into environments or worlds. One game hoping to do just that is Red Dead Redemption 2. Rockstar art director Aaron Garbut says, “This is not a collection of missions inside a big world filled with blips for pick-ups and minigames. It’s much more subtle and much more real. We don’t think of it as a game to be played through. It’s a place for you to get lost in.” After a discussion of how AI may help games reach this level, we turn to Rockstar’s upcoming Red Dead Redemption 2 to talk about its dynamic systems that promise to create a world in which we can immerse ourselves. Video game players have long faced off against and interacted with machines. From the days of playing the bot in Pong to trying to defeat an AI soccer team in FIFA, we’ve battled or worked alongside AI, albeit at varying levels of development. In some cases, gaming AI is programmed as a finite-state machine where the system acts in a specific manner depending on a given input. In simple examples of this technique, the computer demonstrates limited intelligence because it follows one of several possible preset scripts that may or may not match all of the nuance of a given situation. However, if games rely on a larger database of possibilities and use AI to logically cue up and combine their scripts, they might produce enough unique, event-based outcomes to offer an organic user experience. To help do so, video game systems may draw from the Monte Carlo Search Tree to form event outcomes based on a combination of initial coding and prior game situations that then assimilate based on current inputs and future extrapolations. Using this approach, at any given choice intersection, the AI follows some form of a probabilistic or logical pathway down branches to possible outcomes based on combinations of predicted player decisions and its own anticipated responses. Once it considers the possible end results, it then circles back to the main branch where the current decision lies and picks the option that makes the most sense based on what it’s extrapolated. This process can be conducted for every micro-action taken or outcome generated by the AI but may require significant computational power to do so in reasonable time. Because of this, many more techniques exist for creating logistically feasible intelligence in video games and beyond. Methods can be combined, tweaked, or even invented to produce AI that accommodates gaming requests or to produce more advanced machine intelligence. Using some combination of AI techniques, many video game systems internalize and assimilate prior game situations into predictions of future actions in some form of “learning.” A basic example of this can be seen any time the defense in Madden adjusts a linebacker’s position or coverage route based on the fact you’ve successfully run a slant several times over. Video game AI systems may also produce organic outcomes contextualized to specific conditions or scenarios. They include non-player character (NPC) movements and decisions, as well as physics renderings that simulate things like soccer ball ricochets when fighting for possession, collisions, destruction or any other outcomes not fully determined at inception. Although not a video game, Google’s AlphaGo represents one of the best forms of AI to produce game-based contextualized responses by learning from past experience. It beat the world’s best human players in Go, a highly strategic, complex game with a myriad of possible moves to consider. Using neural networks, the system learned best practices from loads of game strategy data before playing the pros. When up against the best, it adapted the strategies learned in training to the tendencies picked up from opponents in order to produce winning gameplans and near-optimal responses. More recently, another AI, AlphaGo Zero, beat the previous champ, AlphaGo, 100 games to 0 after learning the game by iterating against itself. Starting from only a basic knowledge of the rules and the ability to play itself many times (27 million), it bypassed the need for any human knowledge or data in order to create building blocks of understanding, which, over time, merged to form a deep knowledge about Go and its strategies. Thus, AlphaGo Zero represents an even broader intelligence that would, in theory, be able to produce accommodative outcomes no matter the scenario in video games if given the time to build up respective competencies. Such an AI would seem to be suitable for creating organic actions of NPCs and dynamic systems in open worlds. It is crucial to model perception and behavior in open world games where users possess many decision pathways and degrees of freedom within each route of action. This game category opens up various situations and combinations of actions to which AI characters or outcome systems need to respond. Existing AI in open world games cannot nearly accommodate all possibilities, and it will likely be a while before AI as advanced as AlphaGo Zero makes it into a flexible open world game requiring broad intelligence. But where do we stand now? Look no further than Rockstar’s Red Dead Redemption 2. According to those who have seen or played in its open world, it’s an impressive upgrade for AI in games as we progress toward more realistic, simulated and playable experiences. On October 26, Rockstar will release Red Dead Redemption 2, the sequel to its beloved wild west open world adventure game. Some gamers have played or seen glimpses of it behind closed doors at conferences and private events. Their experiences have sparked conversations surrounding how its combination of dynamic systems creates a new level of choice as well as organic event outcomes in the game’s open world. The game will slide into disk drives after eight years of development, during which Rockstar consolidated international teams into one unit to try and create the most immersive and engaging product possible. 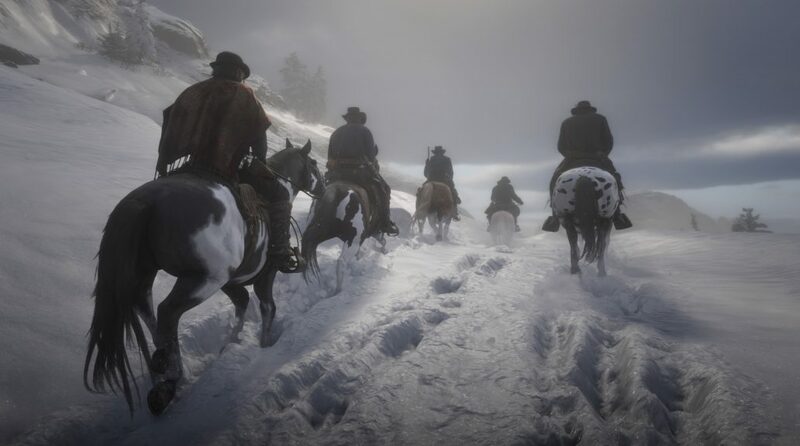 This is the first time the company has generated structures for global collaboration, and Red Dead 2 will be the game company’s first release in nearly 5 years. Red Dead Redemption 2 builds off the acclaim garnered by its predecessor (as well as the popular TV show Westworld) as gamers embark on a new journey, which is set 12 years before the first release. It’s also the first Rockstar production made for the current generation of consoles; their last game, the highest-grossing entertainment product of all time, GTA 5, was released on PS3 and Xbox 360 and then updated to the current generation. Many expect Red Dead 2 to maximize the capabilities of the current-gen hardware. With this comes the intriguing layering of intelligence systems powering characters and environments, as well as the organic happenings resulting from their mixture in a large and detailed open world. Rockstar’s proprietary Rage engine is no AlphaGo, but this time around, it supports increases in the fidelity and variation of interaction with NPCs, animals and events in the world, creating a more immersive experience. Characters will actually behave more like people who operate according to storylines that give meaning to their actions as witnessed by the player. Instead of walking around aimlessly or operating through a looped action in one place until the player leaves the area, the existence of these characters stems more from connectedness to the world via work to do or routines to follow. These NPCs possess their own personalities and mood states, as well as an ability to “remember” past events for reference in dialogue or even future actions. In other words, these NPCs live simulated lives that provide a backstory for being where they are and doing what they’re doing. The goal is to convey to users that the world operates on its own, even when they aren’t around. Hopefully, the 1,200 actors used to create NPCs and their individual 80-page scripts help to make this a reality. Using the new interaction system, we can also engage more with these characters in contextualized manners. Rockstar has incorporated a mechanism for players to decide on pathways of action or to exchange select word choices with the characters. The options differ based on the context of the situation and morph in response to the dynamics of the continued discourse. In the first Red Dead Redemption (and even GTA 5), players could mostly only ignore NPCs, watch them operate their basic and localized actions from a distance or elicit select reactions. Bumping into them, hitting them with attacks or moving objects or generating near-misses with dangerous activity close to these characters would generate reactions. They could flee, verbally respond with anger, fear or confusion or even reciprocate an attack. We expect such reactions in Red Dead Redemption 2, as many of them do actually made sense. However, thanks to the more advanced NPC AI and the improved interaction system, there will be much more variation and contextualization to these encounters this time around. For example, instead of quickly resorting to physical violence, an NPC may escalate the situation with dialogue such that their further responses depend on our actions. This allows for different pathways of back-and-forth between us and NPCs, generating a number of organic outcomes for exchanges. Oh, and every NPC is interactable through this system. Expect characters to not only engage you in dialogue, but to also behave based on who they are as well as how they perceive you. The characters’ personalities will bleed into their interactions, and your choices and prior actions will impact the way people behave toward you. Hygiene also matters. If your character is dirty and muddy, people will react much differently than they would upon seeing a cleaner version of you. The same goes for whether you choose to holster your weapon, the sharpness of your beard and your body composition resulting from your diet. NPCs will even respond to the subtleties in your facial expressions, mannerisms and posture because, after all, these attributes change based on how you choose to play your character and the events that transpire. The highly interactable nature of the NPCs extends to those players will get to know best — their gang members. We will familiarize ourselves with the lives of these people in greater detail as they embark on adventures or engage in organic interactions around camp, where normal camp activities ensue, such as sitting around, talking, gambling, gathering food, preparing meals and sleeping, among others. The richness of the world created in Red Dead Redemption 2 doesn’t seem to end with just its anthropomorphic characters but rather continues with the 200 animals species that also behave and respond to their environment in unique ways. The game will generate systems of animal behavior that perform like those of real food chains. Coyotes will hunt prey but can also be scared off by a bigger predator entering the area. The carcass left in the aftermath of their actions may then be subject to interest by a vulture that swoops down for a meal. Of course, the player or NPCs may find themselves entering into the midst of these events and would therefore have an impact on the actions of the animals as well as the end result. The conditions of animal remains persist and evolve in logical fashion. For example, when hunting an animal for its hide or meat, more damage inflicted onto the being will result in a less valuable sell to the end customer. If transporting the animal back into town on horseback, it may attract scavengers that need to be fought off. Animal carcasses also decay over time. As mentioned, our character’s skin and clothes become dirty based on the environments and materials surrounding him or her. These details and events are dynamic, based on how the user’s behavior intersects with the specifics of the environmental system. Rain will create mud that can then dirty the character (and his or her horse). It will slow players down and impact the functionality of guns. Among many other examples, footprints created by the character will fill with rain as it comes down and snow will sit on the character’s body where it falls. All these systems overlay to create events and circumstances that nudge users to behave in certain ways or to progress through certain sequences of actions. The dynamic nature of characters and the environment allow for mission opportunities, conflict and adventures to pop up organically, creating unique outcomes that may impact future events even further. AI provides game developers with the ability to craft flexible experiences that make sense based on context. With the help of this type of technology, the game can interpret players’ actions and then determine the logical, contextual responses and events to generate in the open world. This creates game experiences that make more sense and feel more authentic, which in turn forces players to think more critically to act in accordance with the world’s people and events. Red Dead Redemption 2 hopes to bring gamers one step closer to an alternate world like that found in Westworld. With continued advances in video game AI methodology and computational allowances, we should expect dynamic, real-time systems to improve and further accommodate gaming experiences. This will make for video games that serve as increasingly-realistic simulations that fully immerse their players. Not only is AI improving games, but AI is benefiting from gaming as well. Games give intelligence systems a chance to perceive some form of reality and run through iterations of various actions fueled by engaged players in a created world. This helps AI discern how actors behave and decipher context. This process creates a feedback loop that secures a shared future for AI and video games. Many expect another important step in this relationship to come on October 26 when the masses experience the intelligent systems in Red Dead Redemption 2. The hype is there; let’s hope it lives up to it. Previous Article Previous post: Disaster is Out There. Is Your Data Center Ready?